CyberLock is an innovative lock system that easily converts existing mechanical locks into fully functional access control systems. CyberLock for Doorways . . . The Videx CyberLock cylinder is an electronic version of standard mechanical lock cylinders. Installation at the lock is as simple as removing the existing cylinder and replacing it with the CyberLock cylinder. Because the key provides the battery power to open the lock, installation in doorways--indoors and outdoors--is fast and easy. CyberLocks for doorway applications include the 6-pin cylinder, small format IC cylinder, mortise lock, and rim lock. The complete line of cylinders gives you the ability to control access to much more than just doorways. The CyberLock cam lock installs in cabinets and drawers, the 6-pin and IC cylinders install in padlocks and cabinet locks, and the T-handle cylinder installs in vending machines. Designed for both indoor and outdoor applications, the durable CyberLock tracks and controls access to outside entrances, computer rooms, padlocked gates, cash drawers, jewelry cases, freight trucks, and vending cash collection routes. The intelligent CyberKey powers the system. CyberKey contains both the battery power to operate the CyberLock cylinder and the specific access privileges for the key holder. For example, a key holder may have access to a lock between 7:45 AM and 5:15 PM, Monday through Friday, and no access on weekends and holidays. The key can also be assigned an authorization time period, so that it can be issued before authorization begins, and will automatically expire at a set time. Each key has a unique ID number that identifies the user, for a high degree of key security. A log of each access event--user ID, date, and time--is stored in both the lock cylinder and the user key, providing a comprehensive history of every use. The cylinder stores the most recent 1100 access events, and the key stores the most recent 1150 events. These access events are transferred to the computer using the CyberKey base station, which connects to the serial port of the PC. CyberAudit software for the PC is your tool for creating your access control system. Manage locks and keys, define user access privileges, create master keys and reset keys, and view a log of audit events from your PC. You can even keep a file of information on each key holder in your system. Program information is sent from the PC to the locks and keys in your system using the CyberKey base station. The CyberLock hardware includes many advanced design features to ensure your security. Since there is no keyway in the lock, it cannot be picked like a mechanical lock. The cylinder resists blows and forced rotation, and remains in the locked position if vandalized. CyberAudit software also provides high-security features. A lock can be set to require more than one authorized key before it will open. 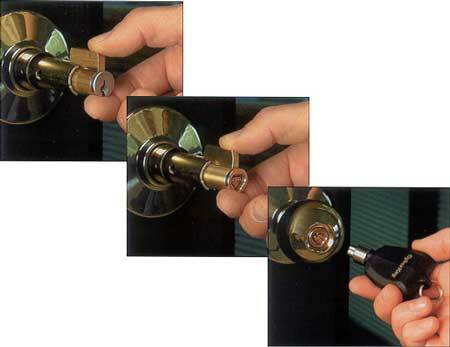 A list of "lost" keys can be stored in each cylinder for when a key is lost or stolen, eliminating re-keying. A reset key allows you to electronically reset the paswords in your locks and keys if the security of your system is compromised. And, you can define expiration dates for each key for additional key control or to provide temporary access. 1.4 x 1 x .62"
1.42" x .93" x .52"
2.5 x 1.6 x .92"
2.95 x 1.25 x .75"
Videx is a registered trademark and CyberLock and CyberKey are trademarks of Videx Inc. Schlage is a registered trademark of Schlage Lock Company. Videx Inc. is not associated with Schlage Lock Company.